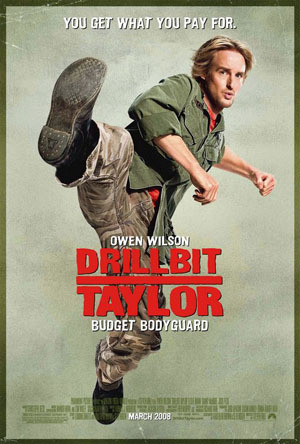 Drillbit Taylor or known as Drillbit Taylor: Budget Bodyguard is a 2008 comedy film starring Owen Wilson as the title character and based on an original idea by John Hughes. Paramount Pictures released the film on March 21, 2008. Two boys, chubby Ryan (Troy Gentile) and skinny Wade (Nate Hartley), are preparing for their first day of high school. Things start badly when the pair arrive at school wearing the same shirt, and get worse when Wade sticks up for a smaller fellow geek, Emmett, (David Dorfman) who is being shoved into a locker by bullies Filkins (Alex Frost) and Ronnie (Josh Peck). The sadistic (and Hannibal Lecter-like) Filkins makes it his mission to haze and humiliate the three at every chance. The trio complain to the principal (Stephen Root), but their concerns fall upon deaf ears. Filkins is furious that the boys have squealed on him, and the hazing gets worse. Wade suggests to his friends that they pool their money together to hire a bodyguard who can protect them. They place an ad on the Internet, and select Drillbit Taylor (Owen Wilson) out of several candidates, mainly because he is the cheapest. Taylor pretends to be a martial arts master and mercenary, but in reality he is just a homeless man who sleeps under a picnic table, showers on a public beach overlooking the highway, and eats out of a dumpster. His real intention of becoming their bodyguard is to rob them and get enough money to go to Canada and start living there. When he shows up in a “borrowed” suit at the boys’ school, he is taken by the school staff to be a substitute teacher, falls in love with a pretty teacher (Leslie Mann), and decides to actually start working as such. He starts really liking the boys and decides to try to really defend them, and teach them also to defend themselves. After Taylor’s criminal friends steal a lot from Wade’s house, Taylor fights them and returns everything to the house. However, Filkins soon finds out from Ronnie (whose mom gave Taylor money) about Taylor’s identity and punches him. Taylor is forced to confess to the boys that his real name is Bob and he went A.W.O.L. from the U.S. Army after a few days of service. The trio fire him and demand their stuff back. The parents soon find out and take things up with the principal. As a result, Taylor is a wanted man and things with Filkins are still not settled. After a confrontation with Filkins, who spoiled Wade’s chance to ask out Brooke (Valerie Tian), an Asian girl who he met on day one, Ryan and Wade, who have gained self-confidence, challenge Filkins to a fight. He agrees if they come to his house for the fight (Filkins is an emancipated minor and owns his own house, which is why they couldn’t call his parents). During the fight Emmett (who previously abandoned Ryan and Wade) shows up for the last part of the fight delivering many small punches to Filkins’ leg. Drillbit shows up and continues to take punches from Filkins until he finds out that Filkins is no longer a minor, after which Drillbit displays considerable skill and beats him up. During the group’s celebration, the police show up and Drillbit, a U.S. Army deserter, is forced to flee. Filkins runs out with a samurai sword and throws it at Ryan, Wade and Emmett, which Drillbit stops just in time by catching it (giving him a gash on his hand and severing his pinky). Filkins is then arrested and taken back to his parents in Hong Kong, and Drillbit taken to the hospital, then prison. Three weeks later, Taylor is out of prison and celebrating with his new friends and new girlfriend Lisa. ~ by darkdestroyer on June 17, 2008.